Amazing Spider-Man #312: It’s a Substitute Goblin War! Home » the big box of comics » Amazing Spider-Man #312: It’s a Substitute Goblin War! Given that Superior Spider-Man readers are being promised a “goblin fight like no other” when the Green Goblin and the “original” Hobgoblin square off in Superior Spider-Man #26 later this week, I thought I would get everyone in the mood by revisiting some past Goblin vs. Goblin showdowns this week. The original Goblin fight took place in Amazing Spider-Man #312, though that showdown failed to feature either “original” goblin. At that point, the first Green Goblin, Norman Osborn was (presumed) dead and his successor, his son Harry, had seemingly retired from Goblin-dom before the second Hobgoblin, Jason Macendale, aka Jack O’Lantern pushed Harry over the edge and back to his villainous alter-ego because he was seeking the famed “Goblin Serum.” Meanwhile, the original Hobgoblin, Roderick Kingsley, was hanging out on the Caribbean Islands somewhere after successfully tricking the entire comic book world into thinking that Daily Bugle reporter Ned Leeds (who had been killed in German) was really the Hobgoblin. I spent an entire summer going over some of this stuff for those who can’t keep up. Point being, while the Green Goblin vs. Hobgoblin battle in ASM #312 was a big deal at the time, but history, and a bunch of story retcons, has seemingly damaged its legacy. In many ways, this issue is the comic book equivalent of being promoted as Ali/Frazier and instead getting a fight between their two daughters. This isn’t to say that ASM #312 is a bad comic. It’s part of Marvel’s larger “Inferno” storyline which bogs it down some. But there’s certainly some fun storyline elements that can be mined from David Michelinie’s script, specifically as it pertains to Harry and his struggle between retaining his sanity for the sake of his wife Liz and son Normie, or giving into his dark side as the Green Goblin in order to survive his battle with Macendale. But the real star of this comic – at least in terms of how I personally remember it – is the artist Todd McFarlane, who was, at that point, 14 issues into his run on ASM and had officially reached supernova status in terms of popularity. After co-creating Venom in ASM #300, Michelinie/McFarlane produced a number of mediocre issues focusing on B/C-list characters like Silver Sable, the Black Fox and Jonathan Caesar, the owner of the apartment building Peter and Mary Jane lived in. Then, at some point, someone in Marvel’s hierarchy realized that they had Todd frickin McFarlane illustrating Amazing Spider-Man, and starting with issue ASM #311, the book kicked off a period I’ve dubbed the “Todd McFarlane draws every A-list villain in Spidey’s rogues gallery” era. That’s when we got covers sporting amazing illustrations of guys like Mysterio, Lizard, Venom and, of course, ASM #312’s Green Goblin/Hobgoblin cover. Given how resistant then-Spider-Man group editor Jim Salicrup was to bringing back the Hobgoblin after his reveal was botched a few years earlier, one has to think that ASM #312 was born more out of the necessity to give McFarlane a chance to illustrate these two iconic villains, rather than having Michelinie produce a story that would have far-reaching impacts on the Spider-verse. 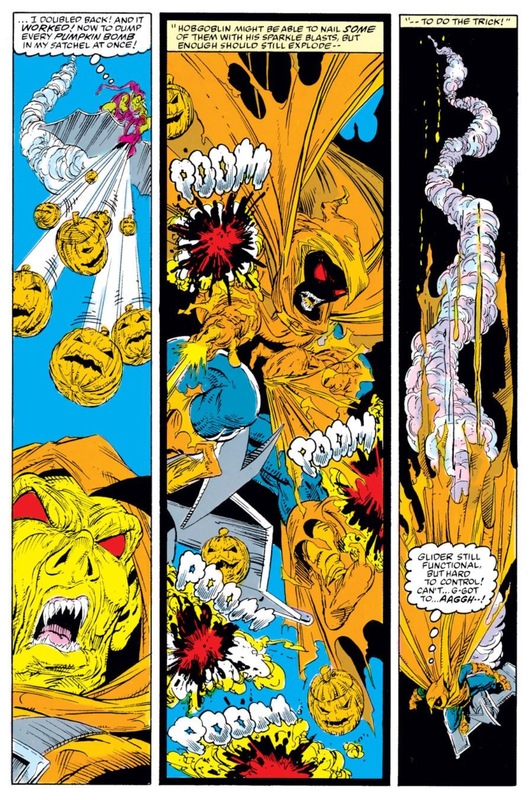 And in his typically stylized way, McFarlane delivers in spades when it comes to this issue’s artwork. Never has either Goblin looked so threatening and deadly. The two engage in a slobber-knocker of a fight that hits all of the nostalgia spots in terms of bringing back the gliders, the pumpkin bombs, the sparkle blasts and the razor bats. It’s completely unrealistic that at this point in his life, the mild-mannered Harry would find a way to emerge victorious against a hardened killer like Macendale, even with Spider-Man there to give his old buddy an assist, but what good is sound narrative logic in a late 80s/early 90s Marvel comic when there was an opportunity to have your superstar artist illustrate two of the Spider-Man franchises most popular villains? Years later, a near mint copy of ASM #312 sells for a few dollars more that other Spidey comics from that era. You got to believe that’s all due to the “Goblin bump” of having McFarlane be the first artist to illustrate both characters in costume, in years. J.M. DeMatteis would go on to write the definitive (and arguably, greatest) Harry as the Green Goblin storyline a few years later, showcasing the character’s descent into madness culminating in his death in Spectacular Spider-Man #200, but Michelinie does an admirable job with Harry in ASM #312. 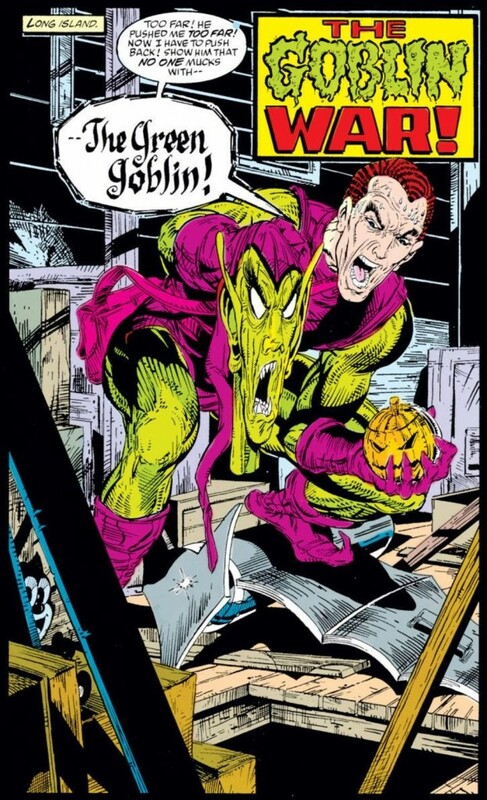 Throughout the comic, Michelinie’s script emphasizes how unwilling of a “hero” Harry sees himself within his Green Goblin attire. He’s not gliding around as the Goblin because of his ego, or because of some thirst for revenge against Macendale. 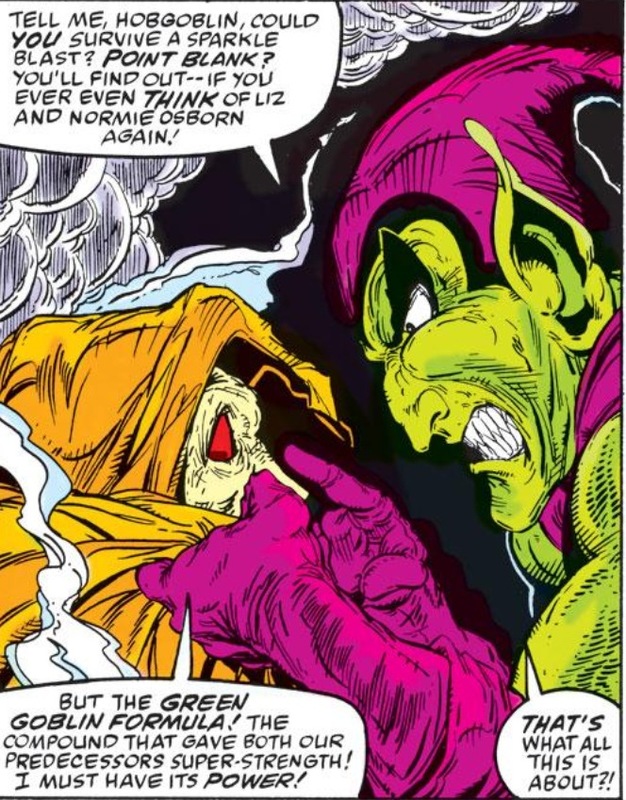 Instead, he’s reacting to some very credible threats from Hobgoblin, making his transformation into the Green Goblin come across more as a last resort rather than a sensible decision. Given where Harry was in his life when this issue was published – married to Liz and only a handful of issues removed from the birth of his son – it would have felt really out-of-whack for Harry to put on the Goblin mask and start laughing maniacally while gliding around New York City again. In fact, in this issue, Harry is so focused on protecting his family, he doesn’t even react to Spider-Man when the Wall Crawler shows up for the Goblin fight. When the story ends, Spidey makes some awkward “we could be partners” comment to Harry, and he responds by telling him he has no time for such trifles since he’s married and has a family to take care of – words that sting Peter, who’s still fresh off his nuptials to MJ. If there’s a clear-cut weak link in this story, it’s Macendale’s Hobgoblin. The character is a tremendous step down in terms of quality and intrigue from the Hobgoblin that was first introduced by Roger Stern and John Romita Jr., in ASM #238. One of the biggest disappointments associated with late-80s/early 90s Spider-Man comics was how the back office drama over the identity of the original Hobgoblin seemingly pigeon-holed future creative teams into writing a total pretender like Macendale as the heir apparent to one of Spidey’s all-time great rogues. In this issue, Macendale not only gets schooled by an out-of-practice Harry, but his motivation for starting the fight – Norman’s Goblin formula – is all for naught when Harry reveals the stuff had been destroyed years ago. 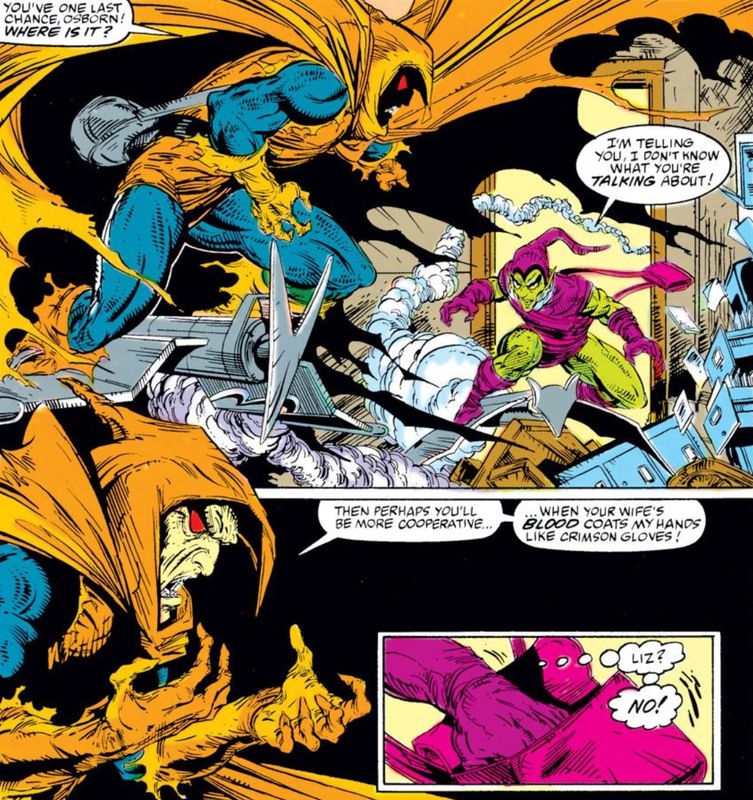 The original Hobgoblin was a meticulous mastermind and sociopath. Macendale’s incompetence besmirches Kingsley’s name. I’ve always thought part of Macendale’s problem was that him being incompetent and inferior was a recurring plot-point. Dude spent six or seven years looking for superpowers, really driving home the point that something was “wrong” with him as a super villain. On paper, the dude should have been a force to be reckoned with, being a trained government killer BEFORE getting access to goblin gear. 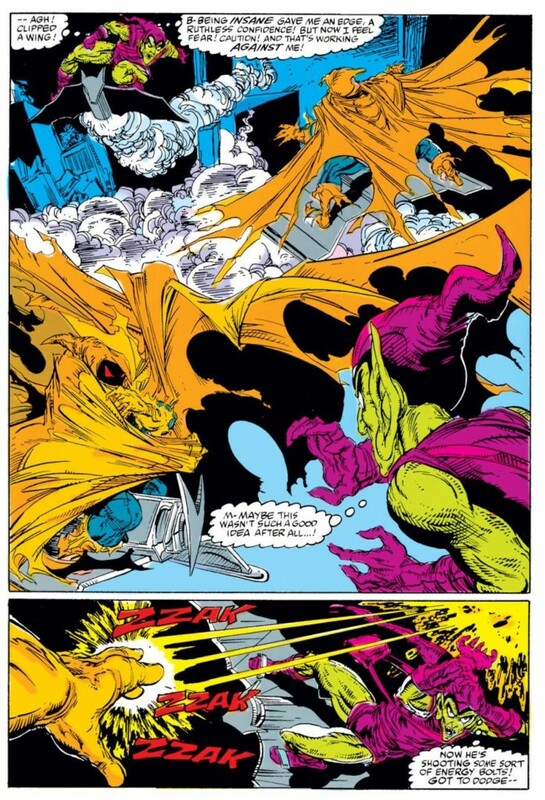 If Marvel had played that aspect up, (neither of the super-powered goblins were trained warriors, which would make super strength a reasonable trade-off), the character might have been more fondly remembered. This was actually one of the first back issues I ever bought and what made me a Mcfarlane fan. 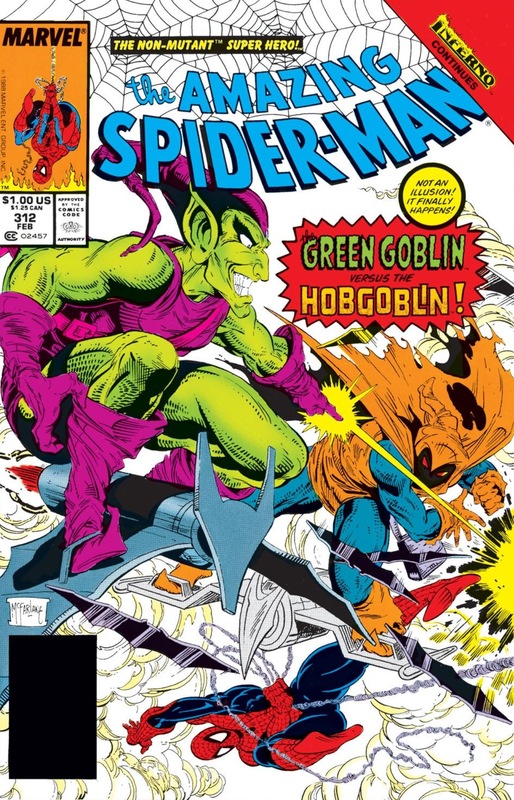 It’s a shame Hobgoblin II never really went anywhere going from one useless story to the next and being so bad he spawned an ever more inferior version of the goblin(Demogblin). Rodrick’s Hobgoblin is easily in my top five Spider-man villains. I agree that Macendale is extremely underwhelming compared to Kingsley. When Kingsley appeared, it was a mini event that made Spider -Man tested. However, when Macendale took over, it was, like, not a big deal at all. No wonder Kingsley killed him.